I went there a few evenings ago. I was tired. You already know this because I’ve been going on and on in every post about how we are moving out of our house at the end of this week. I went down into the Hollow. The sky was soft. The light was soft. The air was soft and down I went and I was the only person and the paths wound around and down over stones and branches, turning but always down. And I began to look for pictures. First I saw green leaves. The new leaves above looked like they were coming out in order to fly away. This is shad. Very famous on Block Island. It fills Rodman's Hollow. In a little while there will be so much shad in bloom that the Hollow will look like it's covered in snow. There were layers of green… tangles leading to thickets, all in different early stages of blooming. 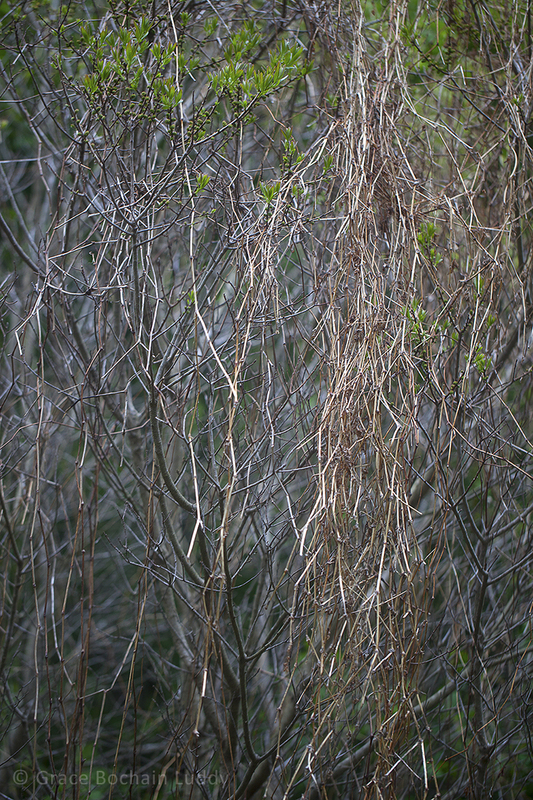 These vines are dry remnants from last year’s growth, draping or falling down like hair or like a waterfall. Here in the Hollow, I felt like a creature in my own place. And my mind left that other world of cleaning and closets and cupboards and lists of things to do. I didn’t hurry in this place. I didn’t have to organize anything. I only had the chance to notice the order that was already there. And of course I had Wilson and Molly with me. Here is Molly being a good girl and coming when she is called. I can’t tell you how much I liked this…how happy it made me, how it softly soothed and harmonized the frayed ends of my mind. I just looked for light and focus and the path brought me deeper and deeper down. Here is Wilson, thinking about it. I wanted you to see the layers and layers of green in the Hollow. There are many dramatic places on Block Island…big places to see long vistas and the ocean crashing and sparkling. But sometimes it’s good to go where small things are happening, small leaves and blossoms in their millions and millions, coming out quietly and (almost) unnoticed in the perfection of their new green beauty. A stand of wind-shaped trees in the Hollow.